(2) Support Activities, which whilst they are not directly involved in production, may increase effectiveness or efficiency (e.g. human resource management). It is rare for a business to undertake all primary and support activities. Value Chain Analysis is one way of identifying which activities are best undertaken by a business and which are best provided by others (“out sourced”). The goal of these activities is to create value that exceeds the cost of providing the product or service, thus generating a profit margin. Inbound logistics include the receiving, warehousing, and inventory control of input materials. Operations are the value-creating activities that transform the inputs into the final product. Outbound logistics are the activities required to get the finished product to the customer, including warehousing, order fulfillment, etc. Marketing & Sales are those activities associated with getting buyers to purchase the product, including channel selection, advertising, pricing, etc. Service activities are those that maintain and enhance the product’s value including customer support, repair services, etc. Any or all of these primary activities may be vital in developing a competitive advantage. For example, logistics activities are critical for a provider of distribution services, and service activities may be the key focus for a firm offering on-site maintenance contracts for office equipment. These five categories are generic and portrayed here in a general manner. Each generic activity includes specific activities that vary by industry. The primary value chain activities described above are facilitated by support activities. Porter identified four generic categories of support activities, the details of which are industry-specific. Procurement – the function of purchasing the raw materials and other inputs used in the value-creating activities. Technology Development – includes research and development, process automation, and other technology development used to support the value-chain activities. Human Resource Management – the activities associated with recruiting, development, and compensation of employees. 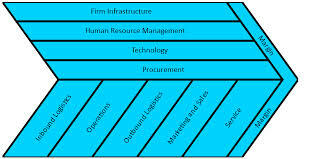 Firm Infrastructure – includes activities such as finance, legal, quality management, etc. Support activities often are viewed as “overhead”, but some firms successfully have used them to develop a competitive advantage, for example, to develop a cost advantage through innovative management of information systems. In order to better understand the activities leading to a competitive advantage, one can begin with the generic value chain and then identify the relevant firm-specific activities. Process flows can be mapped, and these flows used to isolate the individual value-creating activities. Once the discrete activities are defined, linkages between activities should be identified. A linkage exists if the performance or cost of one activity affects that of another. Competitive advantage may be obtained by optimizing and coordinating linked activities. The value chain also is useful in outsourcing decisions. Understanding the linkages between activities can lead to more optimal make-or-buy decisions that can result in either a cost advantage or a differentiation advantage. The firm’s value chain links to the value chains of upstream suppliers and downstream buyers. The result is a larger stream of activities known as the value system. The development of a competitive advantage depends not only on the firm-specific value chain, but also on the value system of which the firm is a part.